AMY Winehouse has been named the least desirable celebrity wife. The 'Rehab' singer - famed for her troubled marriage to drug addict Blake Fielder-Civil, tattoo-covered body and eccentric behaviour - topped a poll by My OK! Wedding magazine, in which readers were asked who would be a terrible spouse. Joining Amy on the list of bad wives were Lindsay Lohan, Britney Spears, Madonna, Gwyneth Paltrow and Lady Gaga, while Charlie Sheen - who entered rehab last week for drink and drug problems - was named least desirable celebrity husband, closely followed by Mel Gibson and Tom Cruise. While Amy and Charlie weren't popular marriage material with readers, Natalie Portman - who is expecting her first child with fiance Benjamin Millepied - was given the title of most desirable celebrity wife, with Britain's Prince Harry being named as the ultimate husband. Megan Fox, Katy Perry and Kate Moss all made the top ten for the perfect wife, while Justin Bieber, Robert Pattinson, David Beckham and Harry's brother Prince William were in the running for ideal husband. Paul Stacey, a spokesman for My OK! Wedding said: "We were stunned by the results. The least attractive celeb brides and grooms were the party monsters. And I was shocked that Madonna, Lady Gaga and Gwyneth Paltrow were in the least desirable top ten. 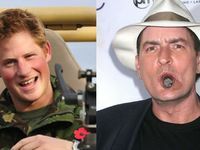 "And amazingly, now that Harry has cleaned up his act and proven himself to the world with his work in Afghanistan, he has topped the poll beating all the expected candidates like Robert Pattinson and even his brother William." Check out more Entertainment news.